Clarksville, TN – Clarksville’s only family owned and operated grocery store, Hilltop Supermarket, is celebrating their 50th Anniversary. They are having bargains all week long to give thanks to the community that has supported them over the years. In 1967, Wayne Hall opened the original Hilltop Supermarket, in a 4,000 square-feet building, with 13 employees across the street. Bursting at the seams, Hilltop moved to it’s current location into a brand new 12,000 square foot store and now had a staff of 30 employees. 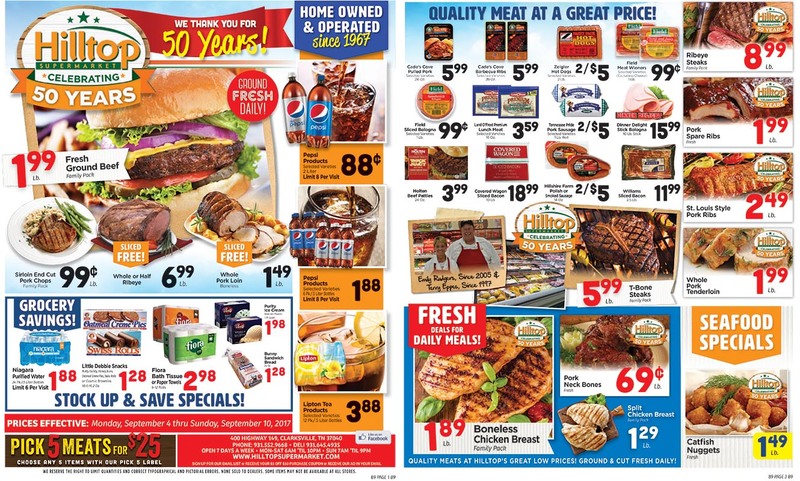 Hilltop Supermarket is having specials all week long to celebrate it’s 50th Anniversary. 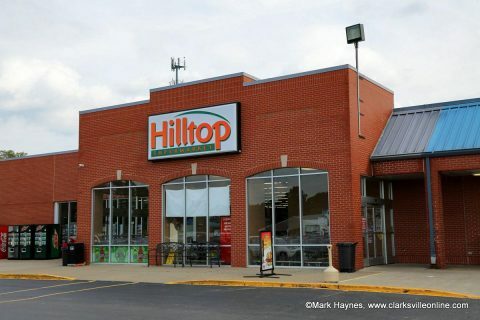 By 1995, Hilltop was in need of more room and started construction of the current store with 24,500 square-feet of space to better server their customers. After a happy career at Hilltop, Mr. Hall retired in 2012. He wouldn’t dream of selling his precious family-owned store to a big corporation, so he offered it to Mike Jackson and his son Cody. They took ownership on New Year’s Day of 2013. Today, Hilltop employs 45 associates that stand ready to serve the communities needs. 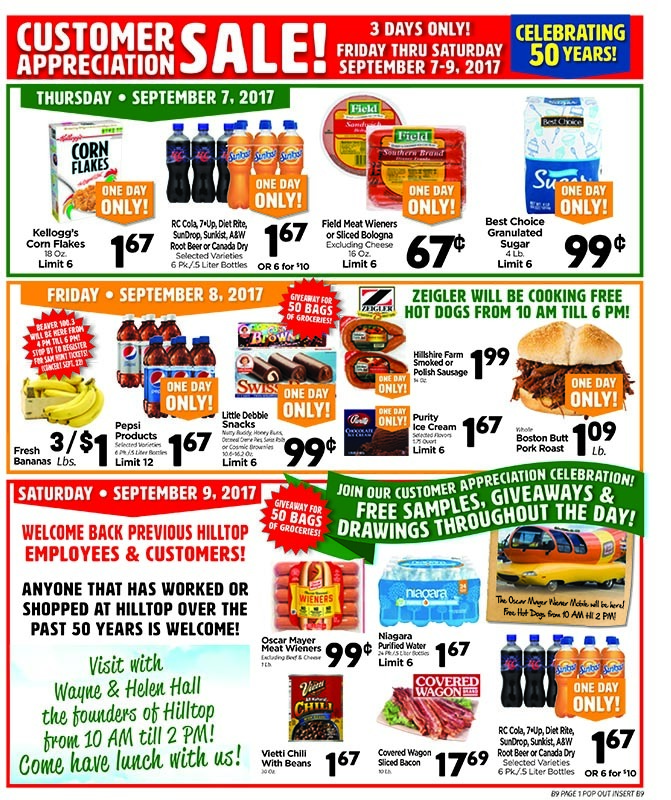 To celebrate their 50th Anniversary, Hilltop Supermarket is holding a Customer Appreciation Sale Thursday through Saturday, September 7th-9th, 2017. Along with the hot bargains all week long, on these three days there will be 5-6 different items each day that will be marked down really really low. Some of the specials this week as Hilltop celebrates their 50th Anniversary. There will also be free samples, giveaways and drawings throughout the day. 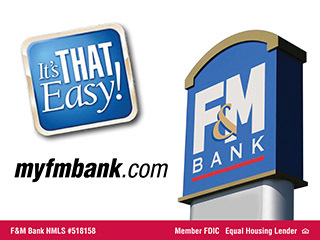 You can register to win one year of: Purity Milk (52 Gallons), Best Choice Milk (52 Gallons), Pepsi Products (52 ’12 pk/12 oz. cans’), Frito Lay Potato Chips (52 ‘9.25-10 oz. Family Size’), Purity Ice Cream (52 ’48-56 oz. Cartons’). You could also win (6) Mark Chesnutt concert tickets for October 14th, 2017. Other giveaway items include a yeti cooler, gas grill, snapple bike, TV and much more. Drawings to be held Sunday, September 10th at 9:00am. You can register for the drawings all week long. On Friday, Montgomery County Mayor Jim Durrett will present Hilltop with a proclamation for all their years of service to the community at 11:00am. 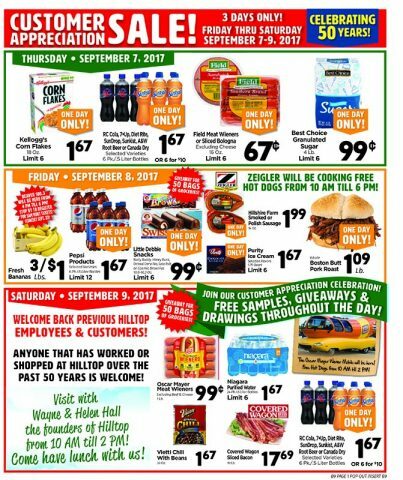 Come out Saturday and visit with Hilltop Supermarket founders Wayne and Helen Hall from 10:00am until 2:00pm. Hilltop will be providing hamburgers and hotdogs for all those that come by. The Oscar Mayer Wiener Mobile will be at the store from 10:00am until 2:00pm with free hot dogs. Hilltop Super Market is located at 400 Highway 149, Clarksville TN. From Clarksville, you would take Hwy 48/13 south across the Cumberland river, turn right on highway 149 and Hilltop Super Market is located on the left at the top of the hill next to Freds. Hilltop serves the grocery needs of the southern Montgomery county area.